Business-Rocking Rule #1 – Before you decide where you want to go, you need to figure out where YOU are! So yes, you do need to run down the year-end revenues, sales, expense and profit numbers to benchmark where your business is, but, even more important, you need to benchmark where YOU are! Are you excited and chomping at the bit to rock your business in 2016, or do you dread what you do? “Dreaders” NEVER win in the business world. Get happy at all costs! Rule #2 – You have to know where you want to go or you will never know if you are getting there! From our conversations with these successful entrepreneurs it is pretty clear thatsetting goals is a huge part of the success formula. Most of the people we talked with had BIG, HUGE goals like retiring by the age of 50! More importantly, they also had nearer term goals like what they wanted to accomplish professionally, first in 2016 and then in the first quarter of the New Year. A couple even knew what they wanted to get done by the end of the first week of the New Year! 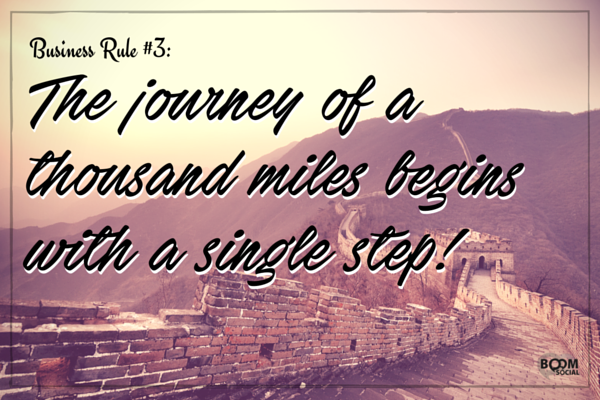 Rule #3 – The journey of a thousand miles begins with a single step! Have you ever done something really hard but incredibly worthwhile that took a long time? Well, there are two really. First, some of the things most worth doing are also the hardest to do. Second, the journey itself MUST be part of the adventure. Very few entrepreneurs are successful quickly and the first time out with a new venture. Most struggled valiantly going through failure after failure only to learn something, try again and eventually hit on the winning formula. Each failure along the way helped them make another, better decision in the future. Have you ever seen a bird trapped in a room? The door they flew in is wide open but they instead throw themselves into the windows and walls. That’s how most unsuccessful entrepreneurs live their lives. With thought, planning and courage they entered a portal into a new venture only to panic once they found out they were trapped. Stop, breathe for a minute. There is an open door to the next great move very nearby. You just have to slow down long enough to see it. Once you have it and you are on the other side, run like a horse with blinders on! Forget the opinions and the naysayers who think you should slow down or make different decisions. They didn’t see the same door you did. Rule #5 – To win in business you must sell something people want (or REALLY NEED)! How are your product sales going? Even if you can sell ice to Eskimos, there are only so many Eskimos, and they will only pay so much for ice. The successful entrepreneurs we spoke to did surveys, held focus group meetings, did pricing analysis and competition scans and refined their products over time to make them a perfect fit for the wants and needs of their ideal prospects. Rule #6 – Great products with great branding wins! This is the other half of rule #5. Very few companies can thrive entirely on the back of a product, regardless of how fabulous it is. Most of them also spend a great deal of time and effort on their brand image, messaging and the customer experience. Rule #7 – Watch the pennies and nickels and the dollars take care of themselves! It was eye opening to see how many of our successful entrepreneurs knew even the smallest details about their businesses. On average, they had 5 – 10 key performance indicators (other than profits) that told them about the health of their companies. They used subscriber count, acquisition cost, lifetime customer value, etc. What are the key metrics that drive your business? 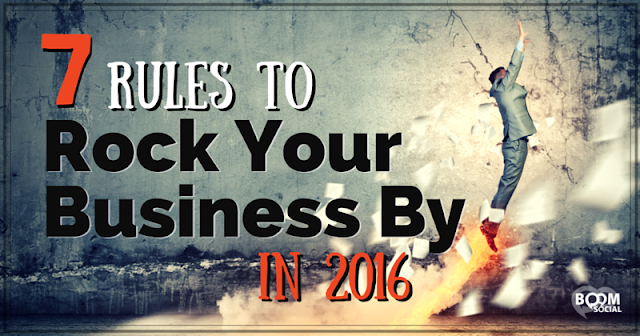 So, now the journey begins and you have 7 rules to rock your business by in 2016!